I haven't had one of these in a while. A good, professional, beta-tested map that shows quality in all departments. 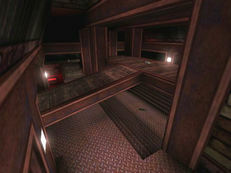 This is an example of a finished level. First, Quazbotch has not attempted to do anything radical or rule-breaking here. He has refined this map so it is perfect for what it is intended for - 1 on 1s. In looks and architecture it is like Conveyor that shipped with UT, only several times smaller, using the RainFX package to create a convincing industrial atmosphere. Do not expect to get a good hunting match here - you can shoot straight to the other side of the map from almost anywhere. Nothing in this map is overdone. Coronas are subtle and realistic, lighting is mostly white but small deep red lights shine near the rocket launcher. Although there is only a small amount of sky visible, the skybox has not been rushed. There are little touches such as steam pouring out of a broken pipe, and a pool of water nearby. And there is an extremely cool secret that had me loling - no, wait I'll let you find that.